In space no one can hear you scream? Scream in Space won a competition run by Surrey Satellite Techonology Ltd (SSTL) in 2011 to propose an idea for an app to run on their STRaND-1 smartphone nanosatellite. With the help of the public, we’re testing the hypothesis that in space no one can hear you scream. It’s a statement that has been well known in popular culture since appearing as the tagline to the 1979 sci-fi film ‘Alien’ – but how many people have really tested this claim? Whilst the conclusion of this experiment may seem clear to many, it is our hope that through this investigation thousands of people worldwide can learn more about several aspects of physics (including orbits, acoustics and much more) and get excited about the field of satellite technology! Dr Chris Bridges recently appeared on the nationwide TV channel Sky News discussing why space is cool. On September 15-16 he will be giving two presentations to the AMSAT-UK International Space Colloquium at the Holiday Inn, Guildford, GU2 7XZ. Chris will cover the Nexus Android Smartphone amateur radio satellite STRaND-1 which will carry both a Resistojet and a Pulsed Plasma Thruster (PPT) module and STRaND-2 which comprises two 3U CubeSats that will use Microsoft Xbox Kinect controller technology for docking. The UK STRaND nanosat team have released this picture in which a volunteer from SSTL, Nimal Navarathinam VE3NML, finishes laying down the cells for the Earth-facing and Space-facing solar panels. STRaND-2, a twin nanosatellite mission from SSTL and the University of Surrey to test a novel in-orbit docking system using a gridded Lidar system based on the Microsoft Xbox Kinect games-controller technology. 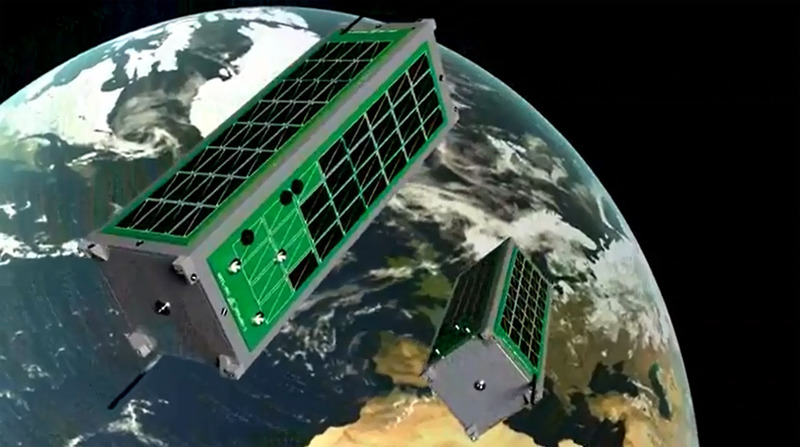 Similar in design to STRaND-1, the identical twin satellites will each measure 30cm (3 unit Cubesat) in length, and utilise components from the Xbox Kinect games controller to scan the local area and provide the satellites with spatial awareness on all three axes – thus allowing them to dock. The STRaND team sees the relatively low cost nanosatellites as intelligent “space building blocks” that could be stacked together and reconfigured to build larger modular spacecraft. The SSTL employees involved with the STRaND programme are volunteers. It is a condition of the programme that volunteers from SSTL and SSC use their own, free time for STRaND activities (such as lunches and breaks). The project has no budget for staff so is entirely dependent on volunteers.